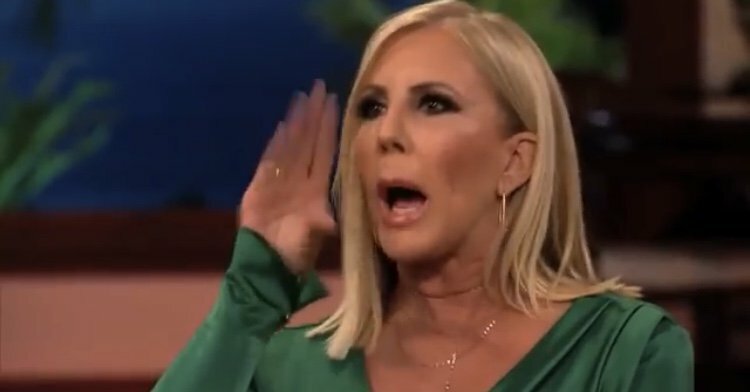 Vicki Gunvalson is the self-appointed OG of the OC. The Real Housewives of Orange County star is the longest standing cast member of the longest running Housewife show. And she doesn’t let us forget it! Sometimes it can be hard to find things to admire about Vicki-she can be loud, demanding, needy and frequently whoops it up a little too much. Plus, she stood by questionable boyfriend Brooks Ayers long after it became clear he was not the Prince Charming she claimed he was. On the flip side, there are some things admirable about Vicki. She seems to have raised good children. And Vicki began an Orange County insurance business which she turned into a big success. Now, however, a long-time client of her beloved company is calling her ethics and integrity into question. Instagram Roundup: Ariana Madix, Kim Zolciak, Bethenny Frankel, Andy Cohen, & More! With Watch What Happens Live taping in Los Angeles all week, it was a guarantee that Real Housewives cast members from the past and present would show up and take a lot of photos together. The Los Angeles taping meant that Housewives and alums from Real Housewives of Orange County and Real Housewives of Beverly Hills showed up in droves. 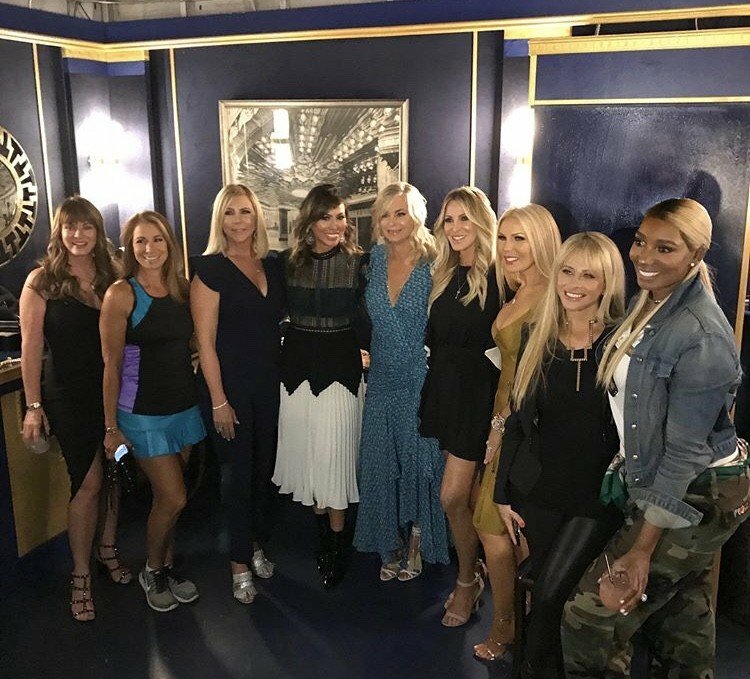 Original Housewives Vicki Gunvalson (obviously), Jeana Keough, and Lauri Peterson showed up for a taping along with Kelly Dodd, Gretchen Rossi, Jill Zarin, Dina Manzo (who lives in California now), Eileen Davidson, and NeNe Leakes among others. Last night’s episode of Watch What Happens Live was packed with (reality) star power. Andy Cohen had Dorinda Medley on as his featured guest and 31 other Bravolebrities rang the doorbell before making surprise appearances. Since the episode was taped in Los Angeles, it was mostly cast members from the Bravo shows that take place in California: Vanderpump Rules, Shahs of Sunset, Real Housewives of Beverly Hills, and Real Housewives of Orange County, but plenty of other notable Bravo personalities showed up. It was a really fun episode to watch, but the 31 extra guests definitely took away from Dorinda’s time in the spotlight- at least in my opinion. There were a lot of Real Housewives of Orange County viewers who were upset when Lauri Peterson left the show so she could focus on her son Josh Waring’s personal troubles away from the spotlight. As much as Lauri was missed on the show, it became clear throughout the years that she definitely made the right choice when Josh continued getting into trouble over and over again. His most recent “issue,” if you can even call it that, was that he was arrested for attempted murder. He decided to represent himself during the preliminary hearing which didn’t go so well. Now Josh has to stand trial. While I was super sad that Lauri Peterson left Real Housewives of Orange County to help her son Josh Waring with his many troubles, I can’t blame her for prioritizing her family. It also makes me wonder why other Housewives didn’t make the same choice, but that’s a whole can of worms to open. Sadly, for Lauri and her family, Josh’s drama has not subsided at all. He was recently accused of shooting someone and now the alleged victim is suing him. That is some serious trouble, especially for someone who’s been struggling to get on the straight and narrow path for many years. This is tough situation for everyone involved and their families. The fans in Bachelor Nation have always been very devoted, but the recent announcement that Nick Viall was chosen as the latest Bachelor has really put the fandom into overdrive. The news broke over a week ago and the Bachelor fans have a lot to say about it. One of those fans is Real Housewives of Orange County alum Lauri Peterson who wants her daughter Ashley Zarlin to join the show and date Nick Viall. Nick was already on three reality shows in the Bachelor franchise, so why not bring in someone from Bravo? Yes, it’s a super random idea, but it would probably bring some additional viewers to the series. The only real issue that I see is that Real Housewives of Orange County is a Bravo show which is a part of the NBC Universal family and The Bachelor airs on ABC, but that might be irrelevant since Lauri hasn’t been a full time Housewife in years. But anyway, let’s get back to the story here.